One of the continuing issues for the conservation of wetlands, particularly sedge fens and species rich wet grasslands is the annual removal of the summer’s growth. Traditionally this was done via scything, especially where horses and machinery could not work on the soft ground. When the need for the “bog hay” diminished as horses were no longer used in agricultural systems, the cutting of these wetlands ceased. Since this time, and to maintain these wetlands in a wildlife rich state, annual cutting and removal of vegetation has been an on-going problem in the UK. Due to wetlands being drained for agricultural improvements, many of these sites are extremely important for their wildlife interest and are now designated as Sites of Special Scientific Interest (SSSI) or Special Areas of Conservation (SAC), Special Protection Areas (SPA) or recognised under the RAMSAR convention on wetland sites. Methods for their management vary, are usually very costly and now often involve the use of specialist low ground pressure machinery such as the Softrak. Material that is cut and removed is rarely utilised and most often disposed of, despite it being a valued crop only a generation ago. 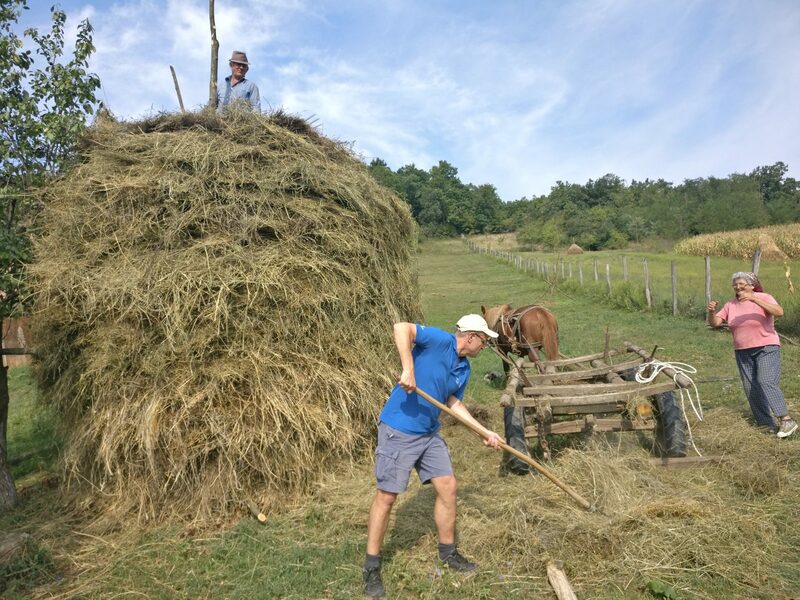 It was clear from our visit that many parts of the Transylvanian region of Romania still have an agricultural system that utilises hay and crops that are harvested using the scythe. Often this appeared to be done on a small scale for each individual farmstead, with patchworks of grassland and crops in strip rotations like crofting sites in The Hebrides and Highlands of Scotland. The fine scale mosaic of cut and uncut fields that is a result retains a highly diverse agricultural landscape. The use of livestock, horses and oxen, as well as the widespread retention of a small number of cattle per farmstead means that grass crops and fodder for the winter period are highly valued. Hay stacks were ever present around every farmstead we saw, often consisting of material that would no longer be considered of any value by most livestock farmers in the UK. Scything is an extremely efficient and cheap method of harvesting when done at this level and is common practice. The retention of the knowledge and skills required is something that has not happened in the UK, it is in fact an extremely rare sight in the countryside. Proposal: – Training scything as a method of managing the sedge fen vegetation and species rich grasslands at RSPB Scotland’s Loch Lomond nature reserve. The Aber Bog and 20 Acre Meadow areas of the RSPB Loch Lomond reserve are SSSI,SAC,SPA RAMSAR sites within a National Nature Reserve in The Loch Lomond and Trossachs National Park. These fen and grassland areas require annual cutting and removal of vegetation to conserve their biological interest. This was done until the 1950’s by scythe with the resulting hay used by local farms. (See pictures). Since cropping ceased, it has proved extremely difficult and costly to take an annual cut as the ground is too soft for most conventional machines and the crop has no value. When there has been a small-scale cut, the material is usually burnt on site. A squad of 6 skilled Romanian Scythers could come to the site in August 2019 and spend a week training up to 20 volunteers. During this week the Aber Bog and 20 Acre Meadow could be cut with the Romanians also demonstrating and training the volunteers how to remove and stack the cut material. The fen vegetation is dominated by reed canary grass (Phalaris arundinacea), and the resulting hay may well prove attractive to the local farms or horse enthusiasts. This would be explored as establishing a potential market for this “crop” would be extremely advantageous, giving it a value rather than cutting to waste. There are many similar sedge fens across Scotland, Insh marshes in Strathspey, Broubster Leans in Caithness for example. Each has an on-going problem with vegetation management and the halting of vegetation succession, scrub invasion and loss of biodiversity. A legacy of the training course at Loch Lomond would be for this to be an annual event with conservation managers and volunteers from across the UK attending and learning. Contact details have been forwarded to Martin and initial dialogue is underway. The RSPB Site Manager for Loch Lomond (Paula.Baker@rspb.org.uk) is very interested in making this happen in August 2019. Once a date is confirmed, participants in this ARCH network visit will be informed and invited to participate. Wildlife management and hunting in Romania – The need for policy change and adoption of copper ammunition. It was extremely interesting to hear how large mammals were tolerated by the farming community and managed by the state. This system, whereby all wild animals were the property of the state, is very different to the UK and has many advantages such as the coordination of monitoring, control, intervention and management. There were obvious frustrations that the system created, it was not easy to arrange for immediate response to problems with wild boar damaging crops for example. However, the fact that no single farmer appeared to either have the ability or the desire to act alone and control large mammals (predator or herbivore), was very different to the situation in the UK. This is no doubt the reason why Romania still retains many of the natural large mammal (and raptor), fauna and was very refreshing to see. The hunting and control of large mammals was a state controlled exercise and this also included sport hunting with paying clients. The rights and wrongs of this can be debated at length, often with no resolution and a lot of heat. If there is accurate monitoring of populations and control /hunting follows a strict population model that retains a sustainable population then we (UK) can have no argument with this, given the fact that we have not actually been able to maintain any populations of lynx, wolf, bear etc. and really struggle to hold onto our much-reduced populations of raptors, wildcat etc. Our populations of our largest wild herbivores are also not really in a good state and as a result neither are our native woodlands. UK Government has now imposed a “voluntary” ban of lead shot over wetland sites and is also considering banning the use of lead bullets for the control and hunting of large mammals (deer). The ammunition industry is also moving towards a phased withdrawal from manufacturing lead based products. Most conservation managers of land in Scotland have now switched their operations to using copper bullets. This is still a source of active debate due to several factors such as the need to alter the weaponry, the effectiveness of the bullet in killing the animal etc. However, the need to remove lead from the environment is of paramount concern by most conservation managers and from the evidence that has been gathered to date. It does not appear to have been followed up with any work on lead bullets. With the likelihood that lead is already in the environment in sufficient amounts to have accumulated in the populations of top predators and scavengers it should be possible to assess this. Carcasses from hunting, road kill, accidents, natural mortality could be used to supply samples to a state run veterinary service that can test for the presence of lead (and other toxins), as is done in the UK and elsewhere in the EU. From this a baseline should be established and the severity of this issue established. If the testing shows little or no lead, that would be a good result. If, however, the testing shows high levels of lead in the populations of bear, wolf and lynx (and large raptors), then measures should be taken to adopt lead free ammunition such as copper. Given the high percentages of the EU populations for these mammals and the implementation of the Habitats and Birds Directives by Romania, a statutory move away from lead ammunition should be an obligation that the Romanian Government seriously considers and adopts.